A more cerebral approach to policy matters under America's 45th president. Who supports a wall-for-legalization deal on immigration? The Trump base – more so than Republicans in general. That’s one of the nonconventional findings in a Hoover-YouGov poll on immigration reform. Tim Kane, the Hoover Institution’s J.P. Conte Fellow in Immigration Studies, discusses his survey’s data and the prospects on an immigration solution in a divided Washington. Two years into his presidency, Washington, DC, is not Donald Trump’s town ceremonially or stylistically – which is how the 45th president wants it. Michael Franc, director of the Hoover Institution’s research and initiatives program in the nation’s capital and a former congressional aide, discusses why DC is in fact Trump’s town for driving debate – and changes on Capitol Hill following the Democratic takeover of the House of Representatives. A baker’s-dozen Democrats have launched presidential efforts; another dozen are weighing a run. Is it a sign that President Trump is easy pickings – or is it a sign that the Democratic party is undergoing an identity crisis? David Brady and Doug Rivers, Hoover senior fellows and Stanford political scientists, examine the state of the 2020 race. Decades ago, a California teachers’ union executive described the notion of educators walking a picket line as “inappropriate, unprofessional, illegal, outmoded, and ineffective.” Paul Peterson, a Hoover Institution senior fellow and director of the Program on Education Policy and Governance at Harvard, explains why that’s no longer the case as teachers coast to coast have walked out of their classrooms over the past year. Six years ago, as US Secretary of State, John Kerry declared an end to the Monroe Doctrine and US dominance of the Latin America. Hoover visiting fellow Markos Kounalakis suggests that the Trump Administration’s response to the constitutional crisis in Venezuela – economic sanctions, the outside chance of military intervention – is an indicator the doctrine is alive and kicking. In 2018, the House went Democratic and the Senate remained Republican – both, as expected. Now, the presidential cycle begins. Hoover senior fellows and Stanford political scientists David Brady and Douglas Rivers, conductors of a recount poll on political trends, discuss what 2018 told us about American politics, the health of the Trump presidency, and what to look for in the new year. As a prolific columnist and observer of U.S. and world affairs, Niall Ferguson has plenty to be grateful for, beginning with an American president seemingly always in the news. Ferguson, the Milbank Family Senior Fellow at the Hoover Institution, explains the many reasons why Americans should be giving thanks this holiday season. Iran – Will Protests Lead to Progress? With Abbas Milani. What does America need to do to maintain and improve military air superiority around the world? Air Force Secretary Heather Wilson offers her thoughts on weapons procurement, recruitment and retainment, plus the changing role of pilots in 21st Century warfare. A departure from the usual Area 45 podcast: instead of discussing the 45th president, we take a closer look at the 31st state in the union – California. 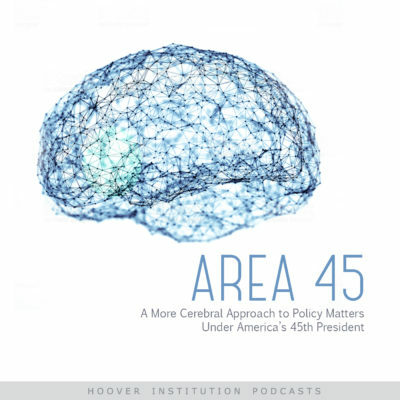 Lee Ohanian, a Hoover Institution senior fellow and UCLA economist, discusses what motivated him to launch Hoover’s new “California On Your Mind” journal and what challenges confront the Golden State’s next governor.